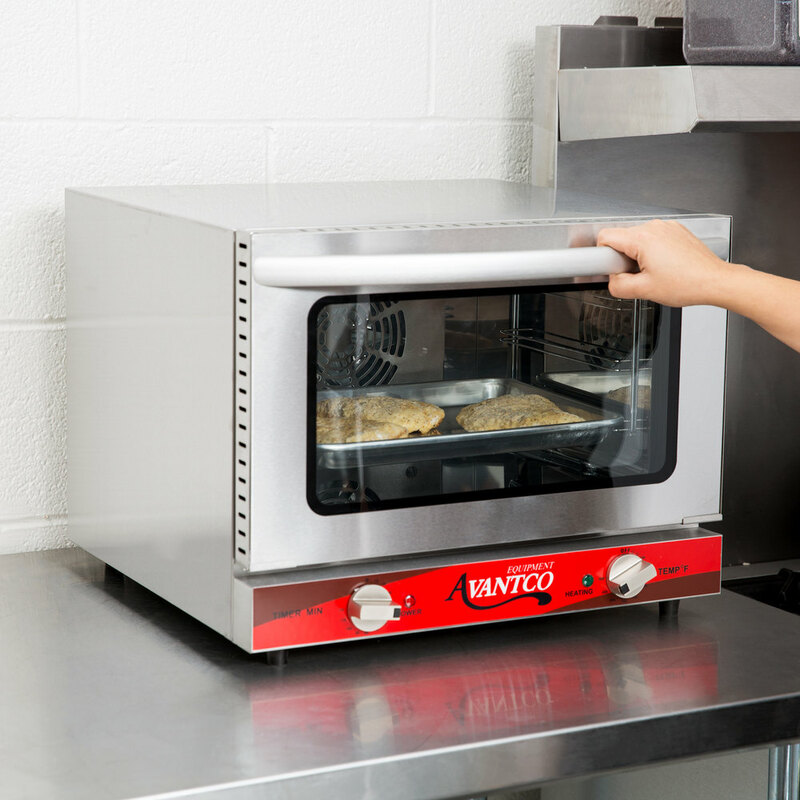 Perfectly sized to cook a 12" pizza, the Avantco CO-14 quarter size convection oven is a great way to make baked goods, snacks, warm sandwiches and more right on your countertop. This 0.8 cu. 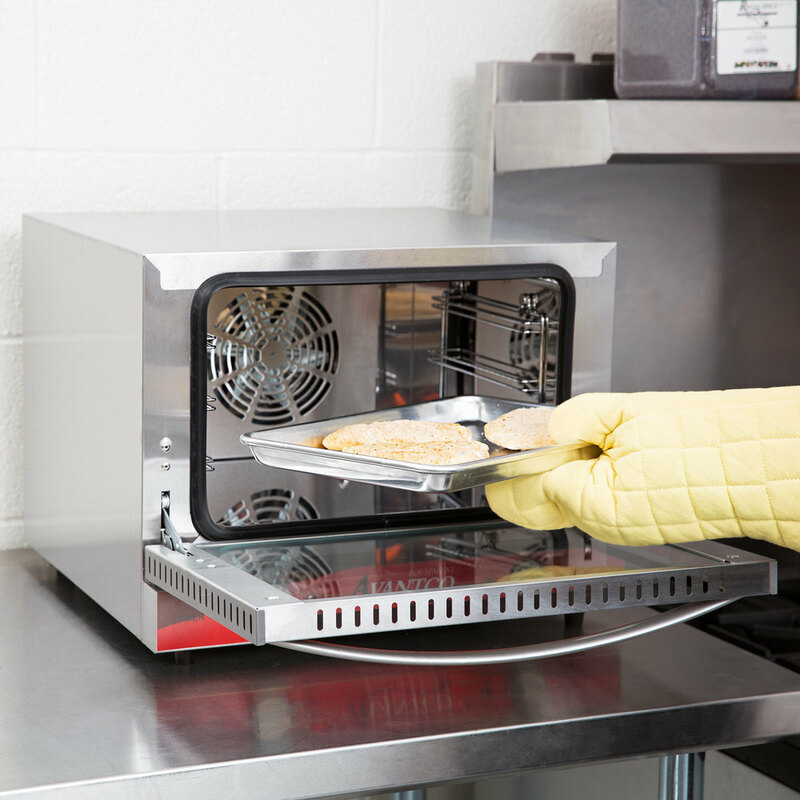 ft. oven boasts 1440 watts of heating power and forced-air heat circulation for even cooking, and can hold up to three, 1/4 size sheet pans at one time. Three chrome wire racks are included so you can begin baking right away! Plus, cooking temperature can be adjusted up to 500 degrees Fahrenheit, and a built-in timer lets you know when food is cooked to perfection for maximum ease of use. This oven's interior and exterior are fully constructed of heavy duty stainless steel, and the cool-touch dual pane glass door window keeps heat in while preventing operator burns on the exterior side. The powerful convection fan is located at the rear of the unit for efficient heat and air distribution. The Avantco CO-14 requires a 120V electrical connection for operation. Decent convection oven especially when you consider the price. Ours has served us well for over a year now and needed nothing except some additional sheet pans, and a good wipedown every morning before firing her up. So far so good, this oven actually does a good job when we bake our signature pay de queso a leaves it nice and golden brown. This little oven works like a dream and keeps up with the demand for pastries and treats on my coffee truck. I wish the front face came off easily for cleaning, but that's about my only complaint. The feet are the first things to fall off. It’s kind of eecpected. We move this around quite a bit so I like how it is lightweight enough. Any larger and we wouldn’t be able to move it. It’s decent, although I would bake in here. Mostly we use it to reheat or toast. We have been using this oven for two months now, mostly for melts in a high volume establishment. The door got a bit squeaky, but no big deal. So far so good, hope it holds up to our usage in the long run. It is easy to clean and it does not take up to much space. It heats up fast so I don't have to wait long getting customers there food quicker! We love it. 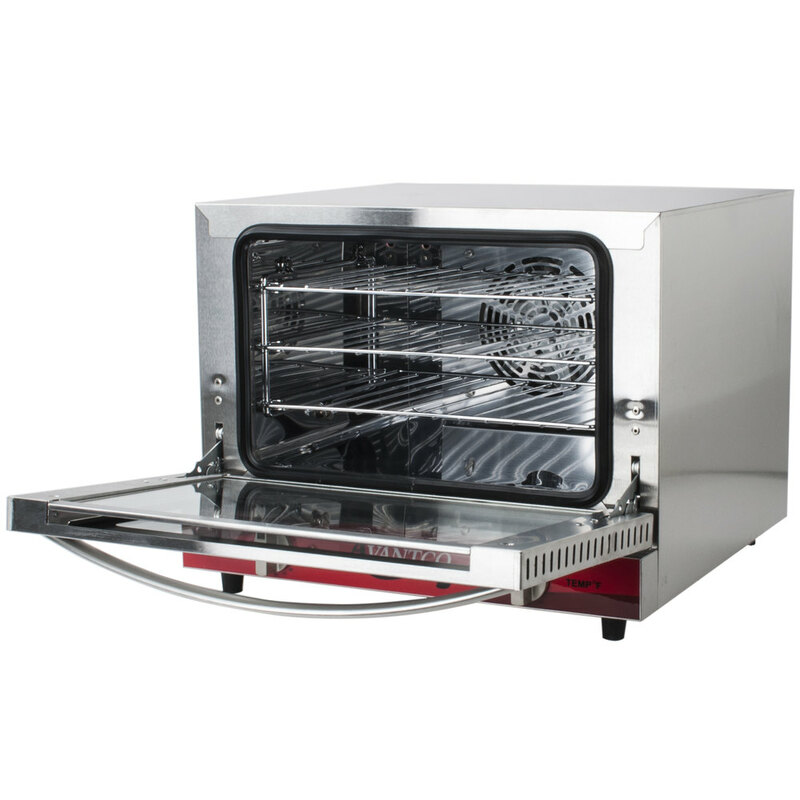 We use this convection oven in our food truck for baking small amounts of products. We are able to throw in some muffins or cookies and serve a nice warm product. Nice counter sized unit. We used it to bake cookies and had no problems with it. It uses a standard outlet so it's easy to set up anywhere. Heats up quick, does its job properly, looks nice, and is inexpensive. It's a great buy, and highly recommended. Only thing I wish...the timer was louder. You can barely hear it standing next to it! The small size works well to place on our countertop in the kitchen of our coffee shop. 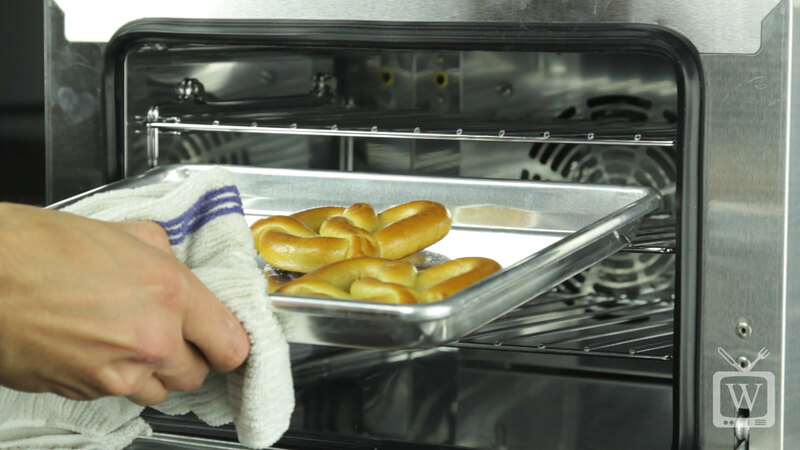 We were able to take out the wire racks and slide the quarter-size baking sheets (https://www.webstaurantstore.com/bakers-mark-quarter-size-19-gauge-wire-in-rim-aluminum-bun-sheet-pan/407BUNQRTR.html) directly into the oven. We use it to bake scones and it has worked pretty well. When following the baking directions on the box of scones for baking with a convection oven, they were undercooked. This could be to poor cooking directions from the scones too. we were able to adjust the cooking times and they now turn out great. this oven is prefect for small coffee shop! i definitely recommend this product! the side of oven was not hot when we use it. i think it is good for safety. I am very pleased with this product. I read mixed reviews on it before purchasing and I was very apprehensive, but after the purchase, I can say that I love this oven. My only complaint at this point would be the dial for the temperature and timer isn't precise. You have to guesstimate on it, but its a great product. This counter top oven is making some killer treats for us at Red Light Roastery that compliment our coffee drinks oh so well! Clafoutis. Savory muffins. So many! This thing is fantastic! We use it in our food truck for pretty much everything. It's a little on the small side but heats up very quickly and produces great results. This is a compact oven that pretty much does its job. It's about the size of a microwave. The top rack is too high to use for anything other than cookies. I found that if I remove all the racks and simply insert quarter sized pans without them, I can use all three tiers. After about 3 months, this oven had an electrical short and would blow a circuit, simply by plugging it in. I was about to pack it up to return it, when I decided to have someone take a look at it. Apparently there is a poor design with the wiring connector. The technician simply used a different (already available) connector inside. It took about 4 minutes for him to fix. I would have given this oven 5 stars, but for this petty problem. Good product for the cost. Doesn't always cook evenly. The three shelves inside cook at different temps if you have all three shelves in at the same time. 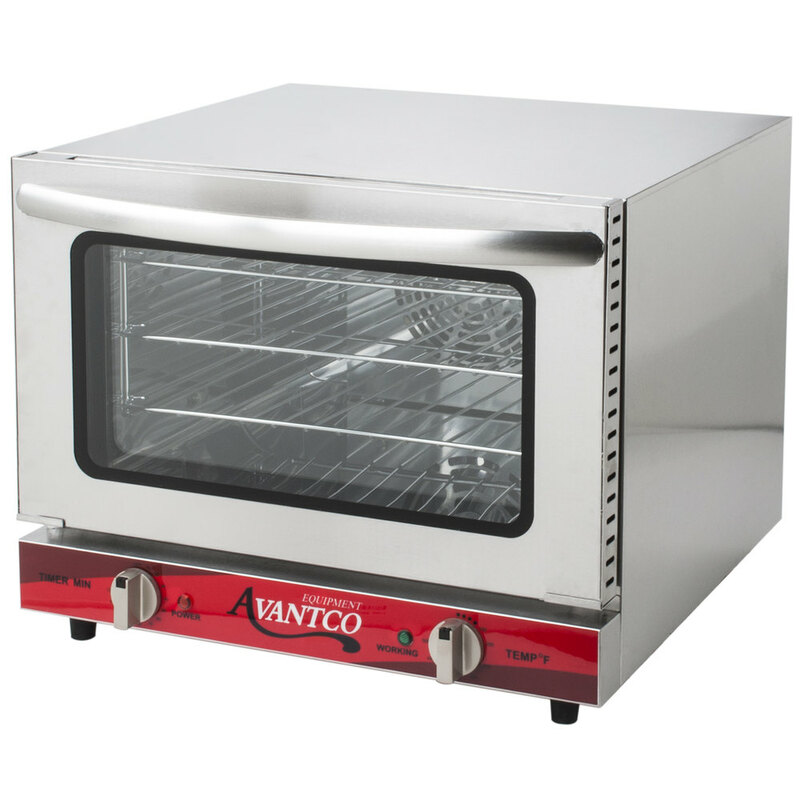 The Avantco CO-14 Quarter Size Countertop Convection Oven, 0.8 Cu. Ft. - 120V only takes up a very small footprint in the kitchen, it warms food up quickly and cooks very thoroughly too. I would recommend this to any business serving food! This countertop convection oven is perfect to keep our breakfast items warm all morning. The dial thermostat is simple and the unit has been performing well for months. Phil R. from Oak Hill Bulk Foods, Inc. The unit came well packaged and protected and arrived on time. This sees daily use on a moderate basis. So far it has performed well and as described. The size is excellent for counter top usage. This is our second Avantco oven. The first was 1/2 sheet size and after less than 12 months had to discard it because the door would not stay closed. The Webstaurant store was kind enough to refund our money. We purchased this 1/4 size oven in February and it is holding up well. Purchasers should understand that Avantco products may be very inexpensive, but they are not the best built product you might expect. This quarter size unit came with a few flaws and design shortfalls, but we have adapted to its quirks and it serves our needs for baking chicken and roasting vegetables. . If I had to buy it again, I would, unless I was going to use it for some delicate type baking purposes where precise temperature control is a must. Pros: the oven door closes well every time so far Cons: The thermostat numbers are not accurate. You will need to insert a thermometer until you get used to where to set the dial for the temperature you need. We always use 350 and with this unit we have to turn the dial to 400 to get a fairly consistent 350. The shelf rack placement was designed poorly. There are three shelves and the top level is so high there is little room for clearance. Avantco could have easily lowered the entire shelf setup as there is ample space below the low shelf. Also, the racks are very thin steel and flex too easily minimizing the weight they hold. There is a timer switch but it only rings a bell, it doesn't shut off the oven, which is weird. Why bother with a switch if that's all it does? If you're looking for a basic use oven without any fine baking requirements you will get your value with this unit. I expect it well last a few years, but that's just a guesstimate. Received the oven (2015-4-28), opened and tested. Electrically supping the oven with a measured 119.5-VAC, 20 AMP, 12 gauge circuit. 1: Removing the plastic protective covering on the top and sides of the oven went smoothly. 2: Beautiful high quality stainless steel inside and out. 3: Commercial duty construction. 4: Heats quickly, uniformly, and quiet. (SPL 58db, 1 meter from unit) 5: The new production run addresses the convection fan issue. Fan now stays on along with the heating element during the entire heating cooking cycle. 6: Good thermal insulation between the inner and outer stainless steel. Outer shell top is cooler than other ovens. 7: Simple controls. 8: Heavy duty 14 gauge power cord. 9: WEBstaurantStore.com ...excellence in website design, customer service and support. The not so good: 1: The protective plastic covering the door, is difficult to totally remove from the top corners of the door. Some still stuck under the stainless steel folds of the door corners. (see photo) 2: Essential to remove the stainless steel door handle allowing complete removal of the plastic protective covering the face of the door. No big deal, two small fillips screws, nonetheless must be done. 3: Due to the colors and design of the front label, it is very difficult to read the temperature and timer settings. 4: The cheep neon indicating lamps are awful. Lamps turn out to be useless. The green "Working" light is difficult to view. Turning room lights off helps. 5: The red "Power" light is brighter by a small margin, still difficult to see. (Indicating lamps need to be replaced with heat tolerant high brightness LED's). The bad: 1: Scratch on the inside center of the outer glass of the oven door. (Questions quality control) 2: When the timer ends it does NOT turn OFF the oven. The "TIMER" is downright USELESS. (Nothing more than a egg timer that ends with a low SPL bell sound) 3: Timer does NOT turn OFF oven consequently this can often lead to over cooking in a busy environment, loud environment or by simple forgetfulness. 4: Timer does NOT turn OFF (mains disconnect) the oven, a possible fire hazard and wastes energy. 5: Timer configuration never mentioned until reading the packaged operating manual. 6: CE and ETL listed but NOT certified or approved. 7: Unit is NOT UL listed or approved. Sum in one word; disappointed. A fantastic oven in need of a few production changes. The oven can easily become close to perfect. We have only had the over for about a week but it works great. Heat up very fast and cooks food well. Chicken tenders and Mozzarella sticks come out hot and crispy, just like from a fryer but without the old. It hold 3 1/4 sheet pans so you can make a lot of food at once. Got this today, and during the initial seasoning run I noticed the fan was noisy, more so as it stopped. It was hitting on the shield in the back of the oven. I took the shield off (I am an appliance repairman) and discovered the nut on the fan had not been tightened! The fan was flopping around. Tightened it up (reverse thread) and all is nice & quiet now. 5- minute fix, but should not have been needed had QC been on the ball! One big downer has to do with the protective film on the unit that has to be removed. The film comes off okay, but that on the door was applied to the panel before the door was put together. Thus, some of the film is under the lips of the other door panels, and will not come out, leaving a ragged plastic piece of film on our beautiful stainless oven! I love this oven . It heats up super fast and bakes great. I cut down a pizza stone to put in mine and it bakes some of the best pizzas! Perfect for snacks when you don't want to have to heat up your big oven. 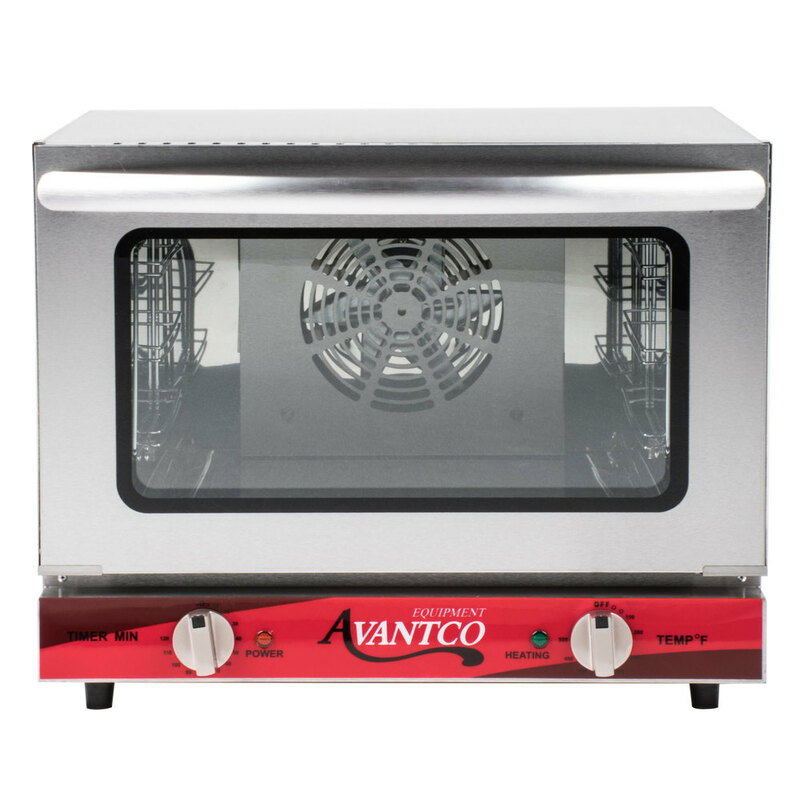 The Avantco CO-14 Countertop Convection oven I bought from you; Every time I use it, it set´s off an awfull vibrating and racketeering noice. The noise it makes is almost unbarable and it doesn´t stop until I am trough baking. In the description of this item on your site: You did not alert us about this problem. All I have had since I bought this oven from you are problems. First the oven came without the racks. Then you mailed the wrong racks. And then it took for ever till I got the right racks.... Now I wonder if they realy are the right racks? Because of the noice they make. Is there anything that can be done to solve this problem? If not, I would like to return ithe OVEN. This is an excellent countertop convection oven. Very spacious inside and it has 3 wire racks included. Controls and features are very easy to use.